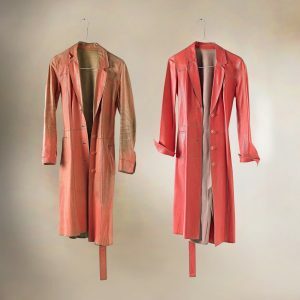 In an industry where fast trends and disposable fashion has become the norm, it is wonderful to see a well-loved and worn flamingo pink unlined leather Karl Donoghue coat from Spring/Summer 2002. ‘Both of these coats are prized possessions. The first one is like a second skin and has travelled around the world with me. Every mark is a trace of that journey and each crease holds a memory. I couldn’t bear the thought that the coat might eventually wear out so I bought a ‘spare’.